We’ve been told that the earth’s surface is quite a bit warmer than calculations predict. Theory has it that heat-trapping “greenhouse gases’ account for a 33 Celsius disparity. But it turns out that our airless moon is also quite a bit warmer than predicted. Might something be wrong with the prediction method itself, then? It’s a natural question to ask, so let’s look into it. Climate science’s method of deriving a surface temperature from incoming radiant energy (whose intensity is measured in watts per square meter) is based on the Stefan-Boltzmann formula , which in turn refers to a theoretical surface known as a blackbody - something that absorbs and emits all of the radiance it’s exposed to. Since by definition a blackbody cannot emit less than 100% of what it absorbs, this fictional entity has no option of drawing heat into itself, for that would compromise its temperature response and thus its thermal emission. Its 100% thermal emission effectively means that a blackbody is a two dimensional surface with no depth. The pictures above illustrate how strange an actual blackbody would be. The purple balloon has been converted to a blackbody, which is just as smooth as the real balloon yet reflects no light from its surroundings - which is impossible because it’s nearly as smooth as glass. Logically, then, this absolutely non-reflective balloon must be infinitely rough - but once again it can’t be, because it is so smooth! In point of fact, a real-life blackbody can only be approximated by a hole, a dark cavity  that you can’t see into, which is not something we normally regard as a “surface” to begin with. Treating the earth’s surface as a blackbody thus seems very problematic from the start, yet this is the first assumption climate science makes when predicting the earth’s temperature . Is it any surprise, then, that even a relatively simple body like the moon would refuse to conform to such a method? 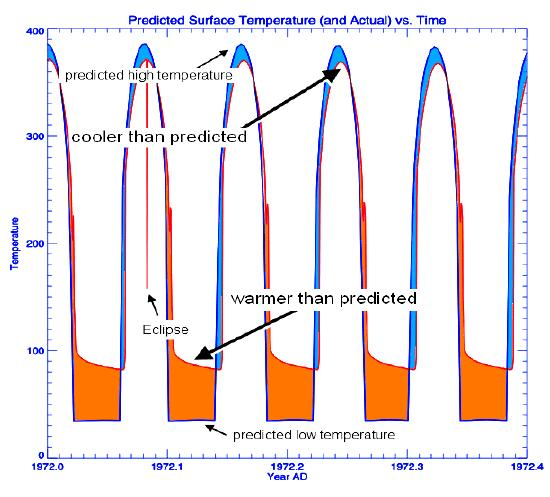 Since an “average temperature” method provides no information about day and night temperatures within a particular zone, NASA scientists working on the Apollo project had to employ a blackbody sun-angle model to chart the lunar surface temperatures astronauts might encounter. Remember, a blackbody’s temperature always agrees with the radiance it’s being exposed to. So, after taking albedo (reflectance) into account, the temperature profile for a blackbody moon would look much like this (enlarged here). As you see, with the first glimpse of sunlight as lunar day commences, the blackbody’s surface temperature rises and keeps rising till solar noon, after which the temperature decline mirrors the rise. Having emitted 100% of its thermal energy at every step, however, this imaginary surface has nothing in reserve to last the night, meaning that a rotating blackbody surface theoretically remains at absolute zero for half of the time. The filled-in blue and orange zones depict the deviation between observed and predicted temperatures in the NASA experiments. 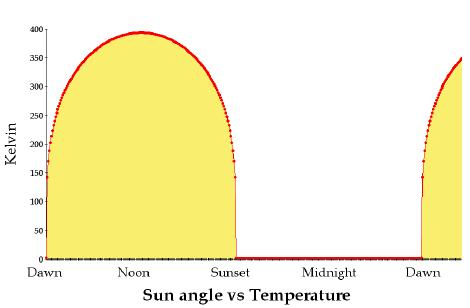 Notice that the peak temperature actually occurs sometime after solar noon. The projected low temperature didn’t plummet to zero in this case because the radiative contribution of a “full earth” in the moon’s night-time sky had been anticipated. As the chart and the study indicate, actual daytime lunar temperatures were lower than expected because the real moon also conducts heat to the inside rather than radiating all of it to space. Conversely, actual surface temperatures throughout its two-week night were higher than expected because the moon “feeds on” the heat it had previously absorbed. Thus (within the zone in question) the surface of the real moon is roughly 20C cooler than predicted by day and 60C warmer by night, the net result being a surface that is 40C warmer than predicted. A Greenhouse Effect on the Moon?